I missed putting this up a few weeks ago but here it is now. September 26th 2010 I had a photo featured on the wire service's Pictures of the Day for the first time. Not only was it selected to be in Pictures of the Day, it also happens to be one of my favorite NFL photos. 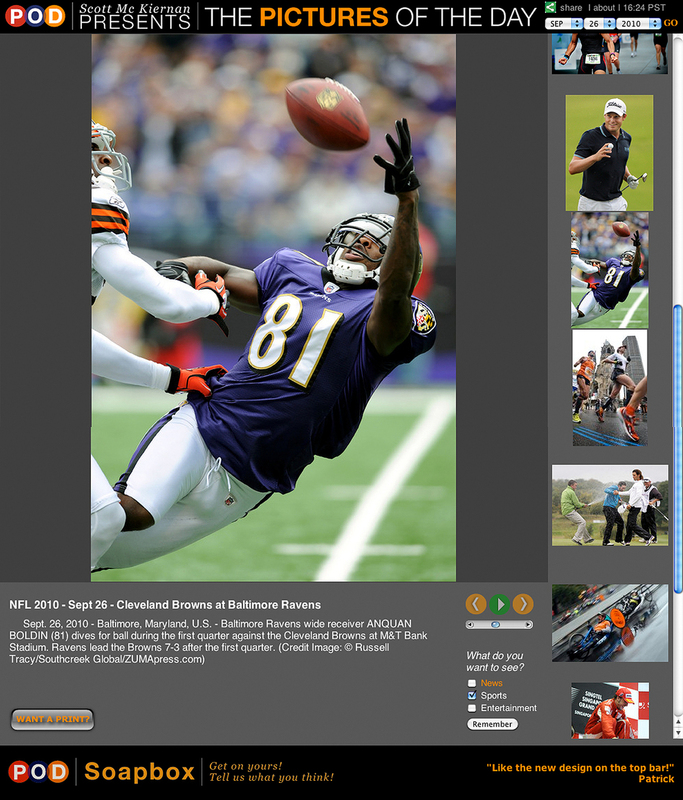 I was photographing the Baltimore Ravens and Cleveland Browns and the Ravens had the ball. I was shooting with the D3 and 400 f2.8 about 15 yards down field. Raven's snapped the ball and I saw Anquan Boldin running down the field towards me. I didn't have time to change cameras to get the 80-200 so I just started shooting as the ball was flying through the air. Right as Boldin passed me he dove for the ball while fighting off the Brown's defender. Here's the shot from Pictures of the Day and the original.